A ground-water system consists of a mass of water flowing through the pores or cracks below the Earth's surface. This mass of water is in motion. Water is constantly added to the system by recharge from precipitation, and water is constantly leaving the system as discharge to surface water and as evapotranspiration. Each ground-water system is unique in that the source and amount of water flowing through the system is dependent upon external factors such as rate of precipitation, location of streams and other surface-water bodies, and rate of evapotranspiration. The one common factor for all ground-water systems, however, is that the total amount of water entering, leaving, and being stored in the system must be conserved. An accounting of all the inflows, outflows, and changes in storage is called a water budget. Human activities, such as ground-water withdrawals and irrigation, change the natural flow patterns, and these changes must be accounted for in the calculation of the water budget. Because any water that is used must come from somewhere, human activities affect the amount and rate of movement of water in the system, entering the system, and leaving the system. Some hydrologists believe that a pre-development water budget for a ground-water system (that is, a water budget for the natural conditions before humans used the water) can be used to calculate the amount of water available for consumption (or the safe yield). In this case, the development of a ground-water system is considered to be "safe" if the rate of ground-water withdrawal does not exceed the rate of natural recharge. This concept has been referred to as the "Water-Budget Myth" (Bredehoeft and others, 1982). It is a myth because it is an oversimplification of the information that is needed to understand the effects of developing a ground-water system. As human activities change the system, the components of the water budget (inflows, outflows, and changes in storage) also will change and must be accounted for in any management decision. Understanding water budgets and how they change in response to human activities is an important aspect of ground-water hydrology; however, as we shall see, a predevelopment water budget by itself is of limited value in determining the amount of ground water that can be withdrawn on a sustained basis. Some hydrologists believe that a predevelopment water budget for a ground-water system (that is, a water budget for the natural conditions before humans used the water) can be used to calculate the amount of water available for consumption (or the safe yield). This concept has been referred to as the "Water-Budget Myth." Under predevelopment conditions, the ground-water system is in long-term equilibrium. That is, averaged over some period of time, the amount of water entering or recharging the system is approximately equal to the amount of water leaving or discharging from the system. Because the system is in equilibrium, the quantity of water stored in the system is constant or varies about some average condition in response to annual or longer-term climatic variations. This predevelopment water budget is shown schematically in Figure 8A. The water leaving often is discharged to streams and rivers and is called base flow. The possible inflows (recharge) and outflows (discharge) of a ground-water system under natural (equilibrium) conditions are listed in Table 1. 1. Areal recharge from precipitation that percolates through the unsaturated zone to the water table. 1. Discharge to streams, lakes, wetlands, saltwater bodies (bays, estuaries, or oceans), and springs. 2. Recharge from losing streams, lakes, and wetlands. 2. Ground-water evapotranspiration. Figure 8. Diagrams illustrating water budgets for a ground-water system for predevelopment and development conditions. (A) Predevelopment water-budget diagram illustrating that inflow equals outflow. (B) Water-budget diagram showing changes in flow for a ground-water system being pumped. The sources of water for the pumpage are changes in recharge, discharge, and the amount of water stored. The initial predevelopment values do not directly enter the budget calculation. Humans change the natural or predevelopment flow system by withdrawing (pumping) water for use, changing recharge patterns by irrigation and urban development, changing the type of vegetation, and other activities. Focusing our attention on the effects of withdrawing ground water, we can conclude that the source of water for pumpage must be supplied by (1) more water entering the ground-water system (increased recharge), (2) less water leaving the system (decreased discharge), (3) removal of water that was stored in the system, or some combination of these three. Pumpage = Increased recharge + Water removed from storage + Decreased discharge. It is the changes in the system that allow water to be withdrawn. That is, the water pumped must come from some change of flows and from removal of water stored in the predevelopment system (Theis, 1940; Lohman, 1972). The predevelopment water budget does not provide information on where the water will come from to supply the amount withdrawn. Furthermore, the predevelopment water budget only indirectly provides information on the amount of water perennially available, in that it can only indicate the magnitude of the original discharge that can be decreased (captured) under possible, usually extreme, development alternatives at possible significant expense to the environment. The source of water for pumpage is supplied by (1) more water entering the ground-water system (increased recharge), (2) less water leaving the system (decreased discharge), (3) removal of water that was stored in the system, or some combination of these three. Thus, the long-term source of water to discharging wells is typically a change in the amount of water entering or leaving the system. How much ground water is available for use depends upon how these changes in inflow and outflow affect the surrounding environment and what the public defines as undesirable effects on the environment. In determining the effects of pumping and the amount of water available for use, it is critical to recognize that not all the water pumped is necessarily consumed. 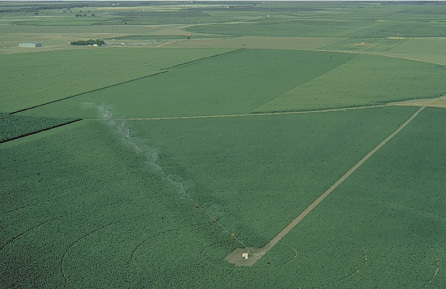 For example, not all the water pumped for irrigation is consumed by evapotranspiration. Some of the water returns to the ground-water system as infiltration (irrigation return flow). Most other uses of ground water are similar in that some of the water pumped is not consumed but is returned to the system. Thus, it is important to differentiate between the amount of water pumped and the amount of water consumed when estimating water availability and developing sustainable management strategies. The possibilities of severe, long-term droughts and climate change also should be considered (see Box B). Long-term droughts, which virtually always result in reduced ground-water recharge, may be viewed as a natural stress on a ground-water system that in many ways has effects similar to ground-water withdrawals--namely, reductions in ground-water storage and accompanying reductions in ground-water discharge to streams and other surface-water bodies. Because a climate stress on the hydrologic system is added to the existing or projected human-derived stress, droughts represent extreme hydrologic conditions that should be evaluated in any long-term management plan. Consideration of climate can be a key, but underemphasized, factor in ensuring the sustainability and proper management of ground-water resources. Consider a ground-water system in which the only natural source of inflow is areal recharge from precipitation. The amount of inflow is thus relatively fixed. Further consider that the primary sources of any water pumped from this ground-water system are removal from storage, decreased discharge to streams, and decreased transpiration by plants rooted near the water table. If the above-described ground-water system can come to a new equilibrium after a period of removing water from storage, the amount of water consumed is balanced by less water flowing to surface-water bodies, and perhaps, less water available for transpiration by vegetation as the water table declines. If the consumptive use is so large that a new equilibrium cannot be achieved, water would continue to be removed from storage. In either case, less water will be available to surface-water users and the ecological resources dependent on streamflow. Depending upon the location of the water withdrawals, the headwaters of streams may begin to go dry. If the vegetation receives less water, the vegetative character of the area also might change. These various effects illustrate how the societal issue of what constitutes an undesired result enters into the determination of ground-water sustainability. The tradeoff between water for consumption and the effects of withdrawals on the environment often become the driving force in determining a good management scheme. In most situations, withdrawals from ground-water systems are derived primarily from decreased ground-water discharge and decreased ground-water storage. These sources of water were thus emphasized in the previous example. Two special situations in which increased recharge can occur in response to ground-water withdrawals are noted here. Pumping ground water can increase recharge by inducing flow from a stream into the ground-water system. When streams flowing across ground-water systems originate in areas outside these systems, the source of water being discharged by pumpage can be supplied in part by streamflow that originates upstream from the ground-water basin. In this case, the predevelopment water budget of the ground-water system does not account for a source of water outside the ground-water system that is potentially available as recharge from the stream. Another potential source of increased recharge is the capture of recharge that was originally rejected because water levels were at or near land surface. As the water table declines in response to pumping, a storage capacity for infiltration of water becomes available in the unsaturated zone. As a result, some water that previously was rejected as surface runoff can recharge the aquifer and cause a net increase in recharge. This source of water to pumping wells is usually negligible, however, compared to other sources. In summary, estimation of the amount of ground water that is available for use requires consideration of two key elements. First, the use of ground water and surface water must be evaluated together on a systemwide basis. This evaluation includes the amount of water available from changes in ground-water recharge, from changes in ground-water discharge, and from changes in storage for different levels of water consumption. Second, because any use of ground water changes the subsurface and surface environment (that is, the water must come from somewhere), the public should determine the tradeoff between ground-water use and changes to the environment and set a threshold at which the level of change becomes undesirable. This threshold can then be used in conjunction with a systemwide analysis of the ground-water and surface-water resources to determine appropriate limits for consumptive use. Systemwide hydrologic analyses typically use simulations (that is, computer models) to aid in estimating water availability and the effects of extracting water on the ground-water and surface-water system. Computer models attempt to reproduce the most important features of an actual system with a mathematical representation. If constructed correctly, the model represents the complex relations among the inflows, outflows, changes in storage, movement of water in the system, and possibly other important features. As a mathematical representation of the system, the model can be used to estimate the response of the system to various development options and provide insight into appropriate management strategies. However, a computer model is a simplified representation of the actual system, and the judgment of water-management professionals is required to evaluate model simulation results and plan appropriate actions. We return to the use of models in the final chapter of this report, "Meeting the Challenges of Ground-Water Sustainability." Because any use of ground water changes the subsurface and surface environment (that is, the water must come from somewhere), the public should determine the tradeoff between ground-water use and changes to the environment and set a threshold for what level of change becomes undesirable. Long Island is bounded on the north by Long Island Sound, on the east and south by the Atlantic Ocean, and on the west by New York Bay and the East River. Long Island is divided into four counties--Kings, Queens, Nassau, and Suffolk. The two western counties, Kings and Queens, are part of New York City. 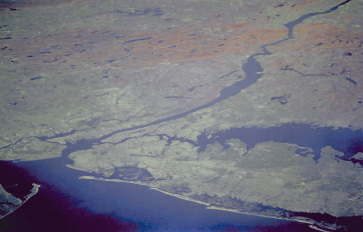 Precipitation that infiltrates and percolates to the water table is Long Island's only natural source of freshwater because the ground-water system is bounded on the bottom by relatively impermeable bedrock and on the sides by saline ground water or saline bays and the ocean (Figure 9). About one-half the precipitation becomes recharge to the ground-water system; the rest flows as surface runoff to streams or is lost through evapotranspiration (Cohen and others, 1968). Much of the precipitation that reaches the uppermost unconfined aquifer moves laterally and discharges to streams and surrounding saltwater bodies; the remainder seeps downward to recharge the deeper aquifers. Water enters these deeper aquifers very slowly in areas where confining units are present but enters freely in other areas where confining units are absent. Water in the deeper aquifers also moves seaward and eventually seeps into overlying aquifers. Predevelopment water budgets for most of Nassau and Suffolk Counties on Long Island are shown in Figure 9. Over the past three centuries, the island's ground water has been developed through three distinct phases. In the first, which began with the arrival of European settlers in the mid-17th century, virtually every house had its own shallow well, which tapped the uppermost unconsolidated geologic deposits, and also had its own cesspool, which returned wastewater to these same deposits. Because population was sparse, this mode of operation had little effect on the quantity and quality of shallow ground water. During the next two centuries, the population increased steadily, and, by the end of the 19th century, the individual wells in some areas had been abandoned in favor of shallow public-supply wells. The second phase began with the rapid population growth and urban development that occurred during the first half of the 20th century. The high permeability of Long Island's deposits encouraged the widespread use of domestic wastewater-disposal systems, and the contamination resulting from increased wastewater discharge led to the eventual abandonment of many domestic wells and shallow public-supply wells in favor of deeper, high-capacity wells. In general, pumping these deep wells had only a small effect on the quantity of shallow ground water and related surface-water systems because most of the water was returned to the ground-water reservoir through domestic wastewater-disposal systems. Block diagram of Long Island, New York, and tables listing the overall water budget and ground-water budget under predevelopment conditions. Both water budgets assume equilibrium conditions with little or no change in storage. The third and present phase of ground- water development on Long Island began in the early 1950's with the introduction of large-scale sewer systems in the more heavily populated areas. The purpose of the sewers was to prevent domestic wastewater from entering the aquifer system because contaminants from this source were being detected in deep public-supply wells. Even though the sewers protect the aquifers from further contamination, they also prevent the replenishment (recharge) that the wastewater had provided to the ground-water reservoir through the domestic wastewater-disposal systems. The wastewater is now diverted to sewage-treatment plants, whose effluent is discharged to the bays and oceans. The decrease in recharge has caused the water table in the sewered areas to be substantially lowered, the base flow of streams to be reduced or eliminated, and the length of perennial streams to be decreased. In Nassau and Suffolk Counties, about 200 cubic feet per second of wastewater (ground water that has been pumped and used) was discharged in 1985 by the three major sewer districts to the surrounding saltwater bodies (Spinello and Simmons, 1992). As previously noted, the only source of freshwater to the system is precipitation. Therefore, the water required to balance the loss from the ground-water system must come primarily from decreases in ground-water discharge to streams and to surrounding saltwater bodies. Capture of ground-water evapotranspiration, spring flow, and some surface runoff are also possible, but each of these sources is limited to a maximum of approximately 25 cubic feet per second (Figure 9). As the flow to the streams decreases, the headwaters of the streams dry up and the streams become shorter. As the discharge of ground water to surrounding saltwater bodies decreases, saline ground water moves landward as saltwater intrusion. Thus, this case is an example in which the determination of sustainable yields cannot be based solely on predevelopment water budgets. The specific response of the ground-water system to development must be taken into account in determining the appropriate limits to set on ground-water use. The High Plains is a 174,000-square-mile area of flat to gently rolling terrain that includes parts of Colorado, Kansas, Nebraska, New Mexico, Oklahoma, South Dakota, Texas, and Wyoming. The area is characterized by moderate precipitation but generally has a low natural recharge rate to the ground-water system. Unconsolidated alluvial deposits that form a water-table aquifer called the High Plains aquifer (consisting largely of the Ogallala aquifer) underlie the region. Irrigation water pumped from the aquifer has made the High Plains one of the Nation's most important agricultural areas. During the late 1800's, settlers and speculators moved to the plains, and farming became the major activity in the area. The drought of the 1930's gave rise to the use of irrigation and improved farming practices in the High Plains (Gutentag and others, 1984). Around 1940, a rapid expansion in the use of ground water for irrigation began. In 1949, about 480 million cubic feet per day of ground water was used for irrigation. By 1980, the use had more than quadrupled to about 2,150 million cubic feet per day (U.S. Geological Survey, 1984). Subsequently, it declined to about 1,870 million cubic feet per day in 1990 (McGuire and Sharpe, 1997). Not all of the water pumped for irrigation is consumed as evapotranspiration by crops; some seeps back into the ground and recharges the aquifer. Nevertheless, this intense use of ground water has caused major water-level declines (Figure 10A) and decreased the saturated thickness of the aquifer significantly in some areas (Figure 10B). These changes are particularly evident in the central and southern parts of the High Plains. The southern part of the High Plains aquifer in Texas and New Mexico slopes gently from west to east, cut off from external sources of water upstream and downstream by river-carved escarpments, as shown in Figure 11A. Thus, ground-water recharge is due almost exclusively to areal recharge from precipitation. Although precipitation in the area is 15 to 20 inches per year, only a fraction of an inch recharges the aquifer due to high evapotranspiration from the soil zone. During predevelopment conditions, discharge as seeps and springs along the eastern escarpment equaled recharge. Today, the magnitude of natural recharge and discharge is small compared to withdrawals for irrigation. Extensive pumping of ground water for irrigation has led to ground-water-level declines in excess of 100 feet in parts of the High Plains aquifer in Kansas, New Mexico, Oklahoma, and Texas. These large water-level declines have led to reductions in saturated thickness of the aquifer exceeding 50 percent of the predevelopment saturated thickness in some areas. Lower ground-water levels cause increases in pumping lifts. Decreases in saturated thickness result in declining well yields. Surface-water irrigation has resulted in water-level rises in some parts of the aquifer system, such as along the Platte River in Nebraska. The predevelopment water budget and a water budget for average developed conditions in the southern High Plains aquifer during 1960-80 are shown in Figure 11B. Comparison of these water budgets shows that, due to irrigation return flow, recharge to the High Plains aquifer increased more than twentyfold from an estimated 24 million cubic feet per day during predevelopment to about 510 million cubic feet per day during 1960-80. This increase in recharge (about 486 million cubic feet per day) together with the decrease in storage (about 330 million cubic feet per day) accounts for over 98 percent of the total pumpage (about 830 million cubic feet per day). Less than 2 percent of the pumpage is accounted for by decreases in natural discharge (about 14 million cubic feet per day). A long delay between pumping and its effects on natural discharge from the High Plains aquifer is caused by the large distance between many of the pumping wells and the location of the springs and seeps that discharge from the ground-water system. The southern High Plains is perhaps the best known example of significant, long-term nonequilibrium for a regional ground-water system in the United States. That is, water levels continue to decline without reaching a new balance (equilibrium) between recharge to and discharge from the ground-water system. Figure 11. The effects of ground-water withdrawals on the southern High Plains aquifer. Schematic cross section (A) of the southern High Plains aquifer illustrating that ground-water withdrawal in the middle of the southern High Plains aquifer has a negligible short-term effect on the discharge at the boundaries of the aquifer. (Modified from Lohman, 1972.) (B) Water budgets of the southern High Plains aquifer (all flows in million cubic feet per day) before development and during development. (Modified from Johnston, 1989; data from Luckey and others, 1986). The preceding two field examples illustrate some of the complexities associated with the use of water budgets to determine the development potential of a ground-water system. Knowledge of the sources and discharges of water to and from the system and how they change with continuing development is needed to understand the response of ground-water systems to development, as well as to aid in determining appropriate management strategies and future use of the resource. Some ground water must be removed from storage before the system can be brought into equilibrium. The time that is required to bring a hydrologic system into equilibrium depends on the rate at which the discharge can be captured. The rate at which discharge can be captured is a function of the characteristics of the aquifer system and the placement of pumping wells. Equilibrium is reached only when pumping is balanced by capture. In many circumstances, the dynamics of the ground-water system are such that long periods of time are necessary before even an approximate equilibrium condition can be reached. In the next three chapters we discuss in more detail the effects of ground-water development on ground-water discharge to and recharge from surface-water bodies, the effects of ground-water development on ground-water storage, and water-quality factors affecting ground-water sustainability.